Savuti is an enigma, a place where the laws of Africa are extended beyond the recognizable. At times it is a river providing a lifeline in a harsh environment, in other times a stark, waterless wilderness. There are no seasons to this contrast, only periods dictated by the forces of nature. Savuti is now dry, a stark paradise where the cries of a not so distant past echo in the haunting silence of the present. 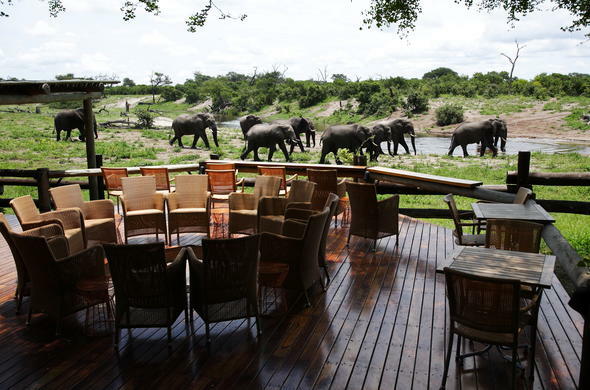 Within this silence is the stirring call of the Africa of legends.Savuti Safari Lodge sits on the edge of the dry Savuti channel, with a waterhole situated in front of the dining room attracting animals seeking relief from the harsh environment. It is a place of great drama where you can sit at your room and watch scenes as ancient as your first memory happen in front of you.The Savuti night is the time when the ancient memory returns. The lion roar in the darkness and the answering of the hyena from a distance pulls the emotions of the past from the deep recesses of our souls. When we are lying in our beds, safe from all earthly dangers, we realize that we are alone and the long hidden fear pulls at our being. We cannot fight back for we are trapped in our self imposed prisons. Our evolution is our undoing. The first light was caressing the horizon as we silently sipped tea and coffee around the fire, each tied in our own thoughts and emotions. Reluctant to break the moment I nevertheless got everyone onto the vehicle and we set off through the Kalahari apple leaf trees on our way to the marsh. During the night I had heard a lot of lion activity from the direction of the marsh and I wanted to find out what was happening.We came across a hyena ambling in the road from the direction of the camp. It was the same one that had been scavenging for food in our camp during the night. He picked up to a mild run as we got closer and finally left the road and disappeared into the bush.The marsh was caught in the dawn, the bare earth shimmering and silhouetting the dead acacias. I turned the motor off and listened. It was quiet, the quiet between night and day, with only the fading stars seeming to cry out as they disappeared into the sky.We found the lion tracks on the road heading toward Marabou Pan. They were of two males and looking at them closely it was obvious the lions were moving fast. With a heightened sense of excitement we followed the tracks. At intervals there were signs of contact. Thinking back on the roars last night I thought that the lions may have been fighting and the tracks bore this out. After a while the tracks disappeared into the mopane. We had lost them! There were some elephants at Marabou Pan and I decided to stop for a break. That is what Savuti is - a paradiseSavuti is the place where the lion / elephant phenomenon was first noted as a behavioural pattern. It was an adaptation by one pride of lions to a situation, and became part of the enigma that is Savuti.As I lay in bed I thought of Savuti and how it always works itself under the skin. Over the years I have seen it become an irritation to some who can not appreciate it for what it is. For those who want the green hills and vast herds, Savuti in the dry months is a massive let down.